WEDNESDAY JANUARY 16, 2019 IN CAPE CORAL, FLORIDA. 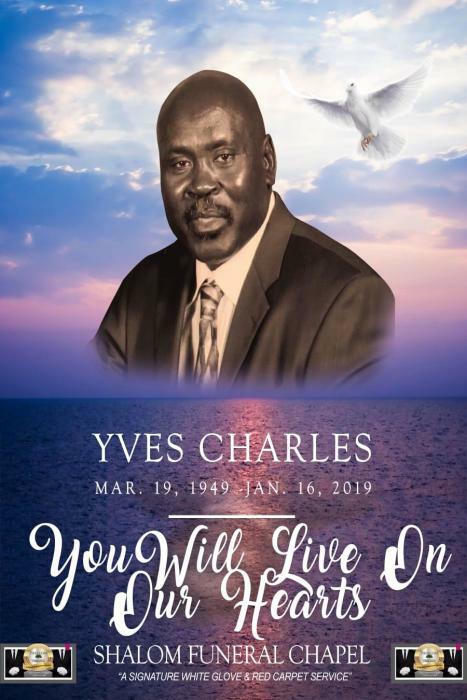 THE FINAL FUNERAL ARRANGEMENTS IS IN THE CARE OF SHALOM FUNERAL CHAPEL IN FORT MYERS, FL. PLEASE LET US KEEP THIS FAMILY IN OUR PRAYERS. FRIDAY FEBRUARY 1, 2019 7:00 P.M. TO 9:00 P.M.
ALL WHITE FLOWERS WITH GOLD BOW WHEN ORDERING FLORAL ARRANGEMENTS. WE WILL BE ACCEPTING FLORAL DELIVERIES ON FRIDAY FEBRUARY 1, 2019 FROM THE HOURS OF 10:00 A.M.